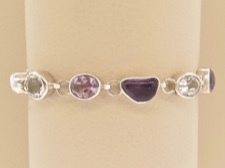 A variety of amethyst stones set in sterling silver and linked with white topaz and white mabe pearls. The amethyst stones have a cascading range of color from the deep opaque cabochons, to a rich purple faceted, then a translucent lavendar stone. The topaz and pearls add a lustrous contrast. This elegant assemble of stones are linked by sterling silver. The toggle can close at 6.75, 7.25 or 7.75 inches.